Published: Jan. 3, 2014 at 08:28 a.m. 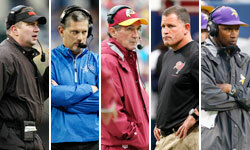 Updated: Jan. 3, 2014 at 10:36 a.m.
Mike Munchak's status with the Tennessee Titans remains a mystery, but answers are coming. NFL Media Insider Ian Rapoport reports, via team sources, that new Titans CEO and president Tommy Smith is flying from Houston to meet with Munchak, who met with general manager Ruston Webster on Tuesday and Thursday. Jim Wyatt of the Tennessean first reported the news of the meeting. Rapoport was told earlier in the week that Munchak's status remains "very much in the air" after posting a 22-26 record with zero playoff appearances over the past three seasons. His 2-20 mark against winning teams has the organization frustrated, as does Munchak's approach to the offense. Tennessee's decision-makers weren't pleased with how the Titans veered away from their run-heavy offense to throw the ball more down the stretch. Rapoport reported that he "would be shocked" if coordinator Dowell Loggains remains with the team. Munchak has been with the Titans since he was drafted by the franchise -- then the Houston Oilers -- in 1982. Tennessee's brain trust is taking its sweet time with this decision, but Friday's meeting is certain to move the needle forward.